This year, my son started third grade. Last week, he brought homework from school that required him to circle the guide words that could be found in a dictionary. His teacher had taught the class, so he was able to do what was asked in the homework but he did it by intuition, not knowledge. While talking with him, it suddenly hit me – He had no idea what a “print” dictionary was. He had never seen one. When I was young, we had 3-4 dictionaries in our home in different sizes and thicknesses. My dad had taught me how to use the guide words at the top of the page to look for words within a page. Then came the Internet wave in late 1990s. I started going to dictionary.com on the desktop computer to look up a word. In 2010, I got a smartphone and promptly downloaded the dictionary.com app. I almost always had the phone with me, so looking up a word became very easy. After my son started school, whenever he asked me the meaning of a word, I sometimes explained the meaning, and sometimes, I directed him to the dictionary app on my phone. It was so simple and easy to find the meaning of a word. About two years ago, I’d found an abandoned dictionary at my office, printed in 1977. Out of nostalgia, I kept it. Yesterday, I took it home to show it to my kids, and they were surprised. 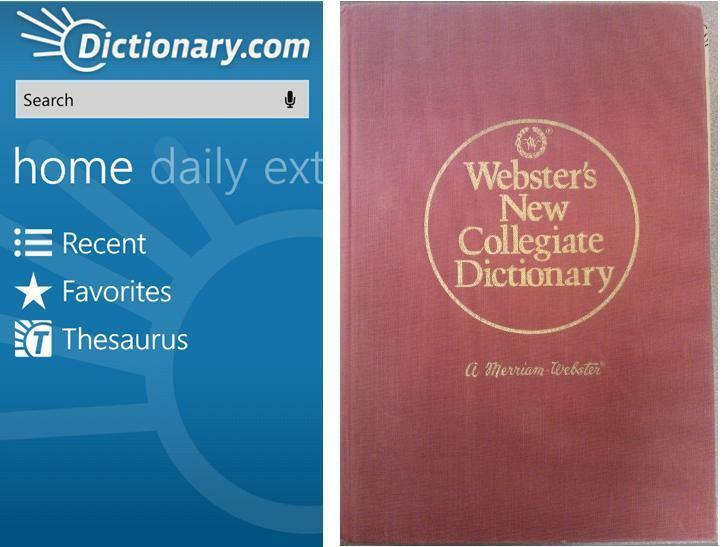 A “dictionary” had always meant a Web site or a phone app to them. A vice president of technology products at Pearson Education has predicted that the print textbooks would be obsolete in five years. Amazon’s CEO, Jeff Bezos, said it would take twenty years for the print books to be completely supplanted by ebooks. At this point, Jeff Bezos’s prediction appears to be more accurate to me. A dictionary is a need-based point-in-time product; it is used as and when needed, for a very short periods of time, which is exactly the phone apps are built for. However, print books, especially textbooks, have a very different purpose and way of usage, but the books can be and are available as phone and tablet apps. The question is – would people prefer it? The data says more and more people are buying ebooks. I personally prefer to read print books, and I would be sad to see the demise of print books. But, “evolution” doesn’t care about me. It just happens.